Photo: Courtesy of Florida Tile, polished travertine. 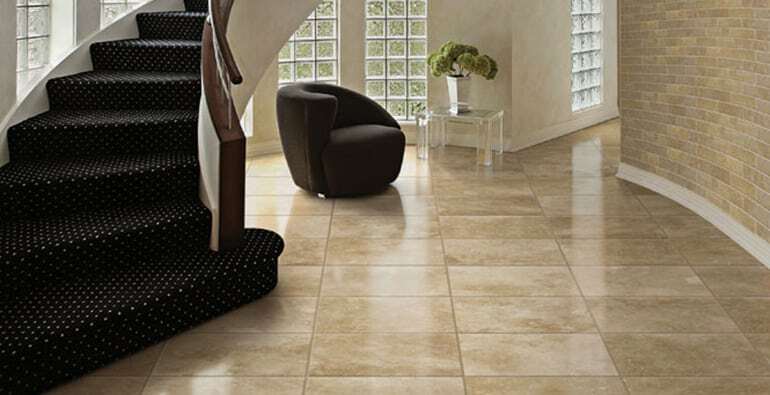 You can bring a hint of nature into your home when you use natural stone tiles in your flooring. Natural stone brings a warmth to your space unlike any other type of material. Installing natural stone is an investment that increases the overall value of your property. Natural stone products specifically limestone, marble, and quartzite are particularly vulnerable because they have a fragile chemical composition that makes it susceptible to damage. Knowing the classification and type of stone flooring is installed in your home will allow you to be able properly cars for it. Conventional household cleaning products cannot be used on stone flooring. Cleaning agents that are acidic in nature such as lemon juice, vinegar and other types of cleaners are harmful to natural stone floors. Dry cleaning agents are abrasive and can damage stone products. Instead, use a mild detergent or products that are specifically geared towards stone flooring. Natural stone can get scratched. Too many scratches the surface can mar the aesthetic features of stone. Therefore, when cleaning you should avoid using vacuum cleaners that have become worn. Accompanied attachments whether metal or plastic can easily scratch stone surfaces. Keeping your home floors perfectly clean is impossible. At some point, you will need to remove stains from your stone floor. When you spill something on your stone floors, you should always start off by blotting the spill. Avoid attempting to wiping the area because this will spread the contaminant. Rinse the area with a mixture of mild detergent and water. Blot the area dry with a soft cloth. Repeat these steps as necessary. At Conestoga Tile, we think it is important that you have the information you need to keep your stone looking great. On our website, you can find wonderful information about this and many other topics. As always, if you have any questions, feel free to contact us!